« How to migrate from Citavi? How to migrate from Mendeley? Migrating from Mendeley to Docear is easy (as long as you did not annotate your PDFs in Mendeley). In Mendeley, first empty your trash. 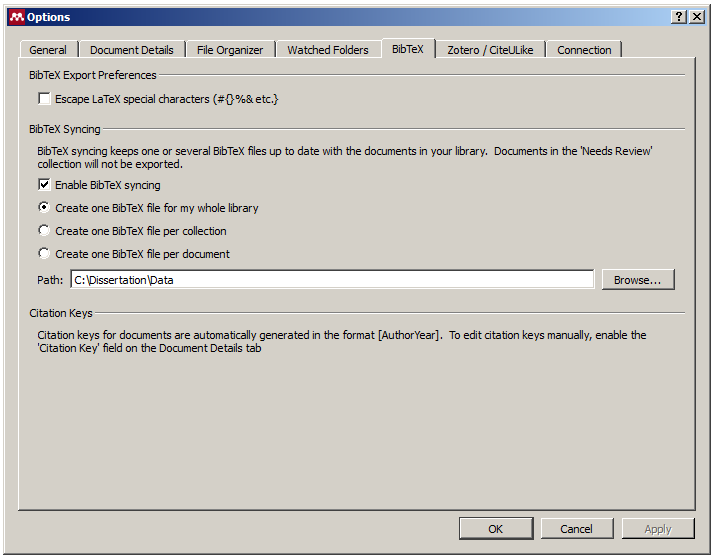 Then, open Mendeley’s preferences and activate “BibTeX syncing” as shown in the screenshot. Specify a path that is within your Docear project home. Then close Mendeley. Now, there should be a library.bib in the path you specified. This library.bib is the file you can use in Docear. 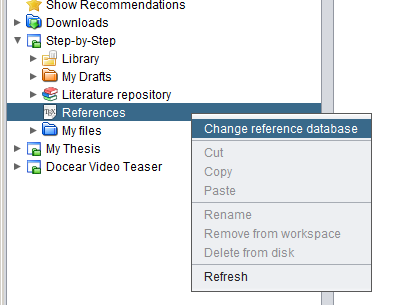 In Docear, open the workspace panel, and do a right click on the “References” entry. Chose “Change reference database” and select the library.bib. If you should experience any problems, please contact help@docear.org. In Docear, just add the folder in which your PDF files are, as new literature repository. This will allow Docear to import all your PDFs. If you created annotations (highlighted text or notes) with Mendeley in your PDFs, then you have a problem. Mendeley is storing the annotations in a proprietary format and hence Docear cannot import them. The only option to access your annotations in Docear is to export each of your PDFs in Mendeley separately via the “Export PDF with annotations…” function. However, even this function does not export your annotations in a 100% standard PDF format. Your comments (pop-up notes) will be exported fine in general but for each comment, a non-removable field is added. In addition, the highlighted text is converted by Mendeley to a plain yellow area that is not recognized as highlighted text by other PDF readers and which hence cannot be imported by Docear (you cannot even delete the highlighted text). You can read more about this in our Blog (in particular in the comments). So, the only solution is to re-highlight all your text if you want to use it in Docear.